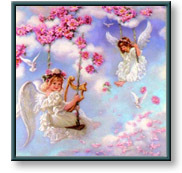 Angels of Joy is a classic example of the exquisite detail and angelic children found in Sandra Kuck's paintings. This is one of three paintings in her 1998 Angel Collection. The other two prints in the collection are Angels' Prayer and Heavenly Hideaway. Angels of Joy copyright © 1998 by Sandra Kuck is prohibited from being copied.